The Highland Humane Society Pets of the Week are three healthy puppies. 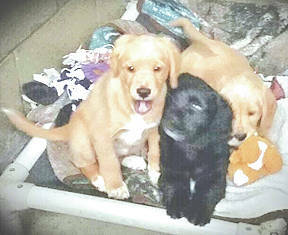 Their mother is a spaniel/beagle mix and their father is a golden retriever. The puppies have not been named. The Humane Society Animal Shelter is hoping someone will adopt them and name them as their new family wishes. The spaniel/beagle mix mother will be available for adoption as soon as she is spayed. The shelter will also have kittens up for adoption on April 14. If you can give any of the puppies or kittens a good forever home, contact the Humane Society at 9331 SR 124, P.O. Box 471, Hillsboro, Ohio 45133 or call the shelter at 937-393-2110. The shelter is open Tuesday through Saturday from noon to 5 p.m. It is closed Sunday and Monday. The shelter’s next Rascal Unit is May 8. The Rascal Unit is a low cost spay/neuter mobile unit that the society brings to the Leesburg Fire Department (back building), every couple of months. It also performs some surgeries and gives shots for dogs and cats. If you are interested, contact the society, make an appointment and pay in advance. https://www.timesgazette.com/wp-content/uploads/sites/33/2018/04/web1_Pets-of-the-week-pic.jpgThe Highland Humane Society Pets of the Week are three healthy puppies. Their mother is a spaniel/beagle mix and their father is a golden retriever. The puppies have not been named. The Humane Society Animal Shelter is hoping someone will adopt them and name them as their new family wishes. The spaniel/beagle mix mother will be available for adoption as soon as she is spayed. The shelter will also have kittens up for adoption on April 14. If you can give any of the puppies or kittens a good forever home, contact the Humane Society at 9331 SR 124, P.O. Box 471, Hillsboro, Ohio 45133 or call the shelter at 937-393-2110. The shelter is open Tuesday through Saturday from noon to 5 p.m. It is closed Sunday and Monday. The shelter’s next Rascal Unit is May 8. The Rascal Unit is a low cost spay/neuter mobile unit that the society brings to the Leesburg Fire Department (back building), every couple of months. It also performs some surgeries and gives shots for dogs and cats. If you are interested, contact the society, make an appointment and pay in advance.